Information on health and disease topics is wrought with pitfalls. Watch the news media or climb onboard the Internet and poorly derived opinions regarding health and disease jump at you from every angle. The information presented is often motivated by commercial interests and based on inaccurate hype rather than objective clinical data or substantial clinical experience. Misinformation is particularly abundant emanating from the ranks of the “Alternative Medicine” and “Functional Medicine” World. Both these loosely defined groups, like the conventional medical world they emanate from, treat disease symptoms rather than address causal factors. They are, as suggested in a previous article, like Dweedle Dum and Dweedle Dee as there is little difference in their approaches from Conventional Medicine. Whether the patient is given Aspirin from the Conventional M.D. or Willow Bark (where aspirin was derived) from the “Functional M.D.”…whether the Conventional M.D. prescribes the anti-depressant Wellbutrin or the “ Functional MD” gives an herb like St. John’s Wort, the same pattern of treating symptoms and ignoring causes remains. Saying that you address causes and actually doing so are not the same. 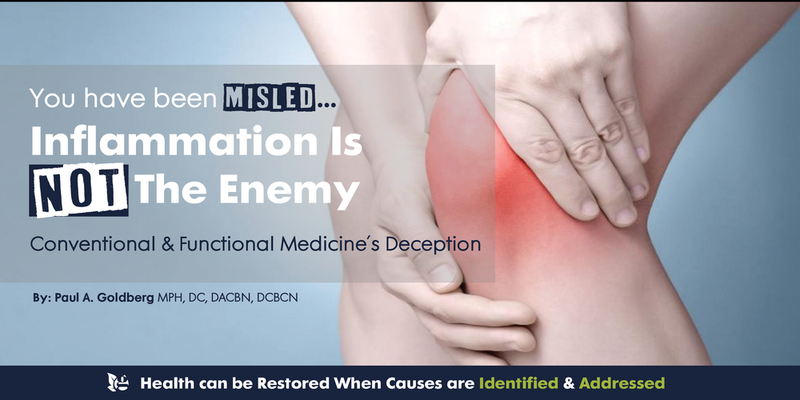 A prime example of the ill advised nature of Alternative and Functional Medicine that has been foisted upon the public is the mistaken notion that inflammation is the root cause of disease and that inflammation must be suppressed. This is another clear indication that “Functional and Alternative Medicine” are no different from Conventional Medicine. Their cry that inflammation is the enemy is false, demonstrating a fundamental misunderstanding of biology and the proper care of the human body in health and disease. Inflammation is not the enemy. Inflammation is a natural and necessary reaction the body generates as it attempts to correct abnormal situations and restore normal function. Inflammation is the body’s primary reaction to injury, infection or other situations where it is threatened by forces perceived as being foreign or injurious. Inflammation is characterized by swelling, heat, redness and pain. This reaction includes heightened blood flow, and an increase of white blood cells and other chemical substances that facilitate healing and combat injurious forces that have entered the area. This is all as it should be as inflammation allows for injury and other abnormal conditions to be rectified while alerting us that something is wrong and needs to be addressed. If our car thermostat shows the car is overheating i.e. the car is inflamed, should we cover the thermostat with tape or should we seek out why the car is overheating? If your hand gets burned (inflammation) by picking up a hot pot, should we take drugs to stop the pain or take our hand off the pot? The answers are so obvious as to make the questions seem foolish. These scenarios, however, are no different than when the joints, intestines, muscles, or other tissues of the body become inflamed and practitioners suppress inflammation through “treatments” as opposed to addressing causal factors. Inflammation is not the cause of itself. It is a basic remedial process the body utilizes to address injury, infection, allergy and other harmful situations it is attempting to correct. The approach of Alternative Medicine, Functional Medicine and Conventional Medicine are the same…to suppress inflammation i.e. to cover up symptoms and interfere with the body’s attempt to heal itself. This is typically done by conventional medicine practitioners with prednisone and the so called “Biological” drugs that turn off important portions of the immune system. Functional and Alternative Medicine Practitioners also utilize these drugs in practice while adding herbs, supplements and other potions and pills. In all such cases, the underlying problems continue, the patient is labeled with one or more “chronic” diseases and importantly does not recover their health. Bio-Hygiene™* rejects the notion that inflammation is something to be conquered or that it is the enemy. Inflammation is a warning. A symptom that all is not right with the body and that a thorough investigation should be made as to what causal factors are at play. It is those causal factors (vastly different from person to person) that trigger the body to engage in an inflammatory response and those factors are what need to be addressed. There are ways to measure inflammation in addition to signs and symptoms, including the Sedimentation Rate and the C-Reactive Protein readings. We use these (along with the signs and symptoms) to measure the inflammatory process and routinely see them drop as causes identified as contributing to the inflammatory processes are addressed and removed (see before and after C-Reactive Protein results below). Many of our videos display our patient’s laboratory studies showing objective evidence of this. Whether the patient has Rheumatoid Arthritis or Ulcerative Colitis, Ankylosing Spondylitis or Crohns Disease, Psoriatic Arthritis or Multiple Sclerosis, causal factors must be identified and addressed. To view inflammation as the enemy and suppress it by the use of drugs or supplements, potions and pills, is living in a fools paradise and takes suffering patients down a long dismal road to ongoing pain and suffering. The human body attempts to do its best under even the most trying of circumstances. Viewing inflammation as the enemy is foolish. Rather we must identify causes of inflammation, address those causes and create the right conditions for health to blossom. Having done so, we can, with joy and satisfaction, watch the body bring itself back into balance and allow us to enjoy long term reliable health we are in control of. *Bio-Hygiene™ was developed by The Goldberg Clinic. It is the art and science of reversing chronic disease by identifying etiological factors, creating optimal conditions to address them and facilitating Re-Creation™ of the body by implementing a restoration program tailored to the individual’s requirements. C-Reactive Protein (CRP) is a blood protein that measures systemic inflammation. It is commonly elevated in chronic disorders including Rheumatoid Arthritis, Psoriatic Arthritis, Crohn's Disease, Ulcerative Colitis, Ankylosing Spondylitis and other chronic inflammatory conditions. C-Reactive Protein is also used to assess cardiovascular disease (heart attack and stroke) risk. The following are before/after HsCRP test results from patients at the Goldberg Clinic. The improvements seen came by addressing causal factors and without the use of drugs, herbs or other treatments/therapies. To see more before/after CRP results from the Goldberg Clinic in addition to those shown below, click here. To see more before/after CRP test results from the Goldberg Clinic in addition to those shown above, click here.